In the early middle ages Wales was divided in several kingdoms, each with its own laws. Hywel ap Caell, usually known as 'Hywel Dda' or Hywel the Good, who became king over nearly all of Wales in 942, is credited with having brought these different systems into a single body of law, although three different versions exist: for Venedotia (north Wales), Dimetia (south Wales), and Gwent (south-east). The Law continued in use in Wales until the union with England in 1536. This is the finest copy of the code of Hywel ap Caell. Diagram illustrations represent a kind of amplification of the code which happened over the centuries after it was first published in the 10th century. 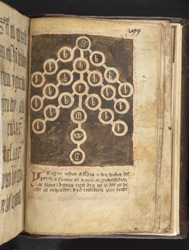 The meticulousness of the diagram and its inscriptions expresses the status of the laws as one of the peaks of intellectual achievement of medieval Wales. When this manuscript was made and used, the Welsh were being politically and socially subordinated by the English Parliament. The grandeur of this manuscript may have been a reaction against the limitations on power and privilege.